The market in Carlisle, Farmers on the Square, held the last session of the growing season yesterday. It is a bit worrisome..we have a bushel of apples in cold storage, chicken, beef and pork in the freezer, canned tomatoes, pickles and cucumbers (strawberry jam all gone), honey, maple syrup, a few eggs every now and then. Plenty of lettuce, kale and chard growing out back. 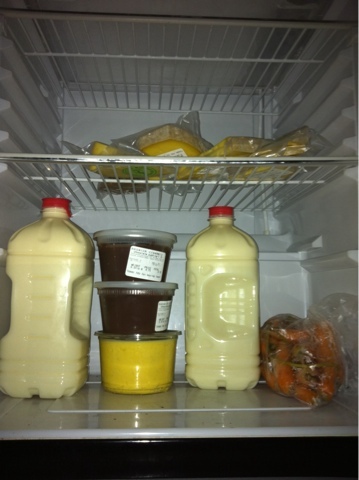 But milk, cream, cheese, yogurt and Homer's beloved chocolate pudding are heading into hoarding mode. Not that we can't get them from our local farms..but it is an hour or so drive to do so. In two different directions. Next market is the end of January, so we are contemplating reasons/excuses to visit these farms in a couple of weeks. Homer has a cold and is not feeling well. Evidence here: the chocolate pudding is untouched. He always has some on Wednesday night..this is the first time this has happened. Poor guy, this cold has him in its grip, so much so he did not get his pudding face on.